It's great to be back here setting you a new challenge after taking a little break to deliver our 12 Days online workshops. Both of us and our respective work-rooms and all available surfaces are [almost] back in 'pre-manic-class' shape ... and we've been treating ourselves to a little luxurious eye-candy. 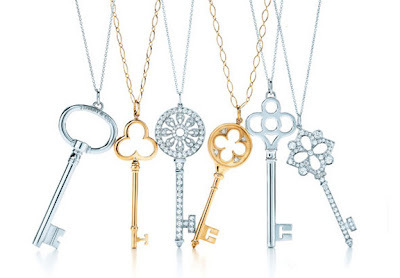 According to the Tiffany website this range is: "A magical collection of Key pendants brimming with intrigue and allure" and I can't help but agree! The plainest ones are my favourites with their clean, strong, handsome shapes there's nothing fiddly and delicate [not my kind of thing] about them. Not only are they aesthetically glorious, they also seem to evoke cosy feelings of home and belonging in me. In short, I love them. So much so that there's only one thing taking the edge off my adoration ... their price! At anything from £80 to £9,140 I suspect that they may stay on my 'Wish List' for quite some time. If you get a chance have a look at the full range here on the Tiffany site ... but please don't hold me responsible for any overwhelming covetous urges you get while browsing. Julie's project: I bet you've got a place somewhere in your home, be it a drawer, a hook, a bowl etc in which languishes every key you've ever known but which you either [a] can't remember what they unlock and hold onto them 'just in case' or [b] you can remember what they unlock [eg: your parents' old back door!] and despite it being of no earthly use to you ...you hold onto them 'just in case'. I think you know what I'm talking about! Best of all ... my new ornaments cost me nothing as they were made entirely from things I already had, so I can put all my spare funds toward saving for the real thing! Like Julie, I too have a place for keys old, spare and of uncertain origin. When I come across one, I put it in a safe place, ready for . . . well, times just like this, when I have need of an otherwise useless key. The trouble with safe places, however, is that you can only ever locate them once - the once when you put something there to keep it safe. It isn't just me, right? So, short of sacrificing my front door keys, or driving the length of the country to raid Julie's highly-organised key bowl, I had to improvise. Languishing in my art cupboard (it's next to the boiler cupboard, and so very warm and enticing just now), I have two boxes which don't get used as often as they should. One contains moulding paste and the other, resin. They work beautifully together, and the paste seemed a perfect way of recreating a real key without suddenly finding myself locked out. Making a mould is as simple as pressing the key into a sausage-shaped lump of paste, and I then added the resin and waited patiently until it had set (that's 'patiently' like an eight-year old on Christmas eve...). Once de-moulded, I spread a small amount of clear-drying glue over one side and sprinkled some super-fine glitter on top for a shimmery finish. 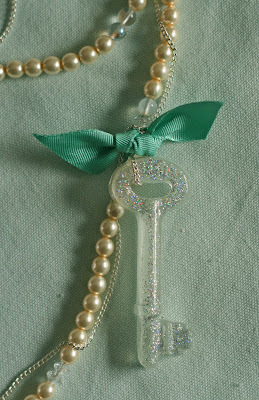 At this point, you could happily use the pretty, sparkly, semi-transparent key as an ornament, to decorate a card or layout, or - taking inspiration from Julie's pictures above - tie it to a length of ribbon (Tiffany turquoise, please) and hang as a tree decoration. 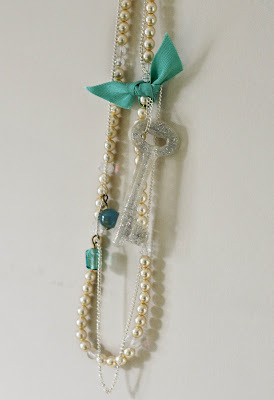 To up the ante a little, though, I added mine to a junky, vintage-inspired necklace - a length of silver chain, some threaded pearls and crystal beads, a few chunky turquoise beads and a scrap of Tiffany-inspired ribbon to really highlight the key. It might not be quite as festive as Julie's project, but there's really no reason you shouldn't look every bit as well-decorated as the tree at this time of year. Now it's your turn. 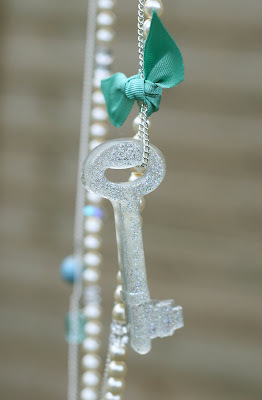 What do you fancy doing inspired by Tiffany keys? By the way - as pointed out by Kirsty - 'Tiffany Keys' does rather sound like a real person doesn't she it rather than an item of luxury jewellery?!!! take a photograph / make a layout / write a poem / record a story about a set of keys which have been significant to you in your life. Whatever you decided to do we want to see it - remember to link us up to your project or leave it in our Copy+Paste Flickr gallery. We love to see how you all copy the same inspiration point and yet go on to paste such unique responses and we hope you can have a bit of fun with this challenge even at such a busy time of year! I'm now going to make a swift exit before I succumb to the urge to make a pun about your contributions being the 'key' to our Copy+Paste community ... or something equally as comedically feeble!! Nice to see you again, it's been fun, we should definitely do this again sometime!